It’s been quite a while since the perpetually busy Luke Vibert last brushed the dust off his disco / electrofunk-centred Kerrier District alias. 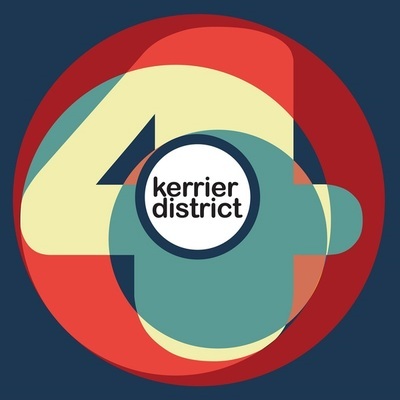 Indeed this third album, deceptively titled ‘4’ offers up his first longplayer under the moniker since 2006’s ‘Kerrier District’ and the first new material since 2011’s ‘Kerrier District 3’ EP. If anything, the twelve tracks collected here see Vibert refining the approach he’s pursued on preceding KD releases, rather than really ripping up the rulebook. That said, ‘4’ manages to come across as distinctly deeper and lusher than its predecessors, something that’s no mean feat in itself. ‘Discogram’ opens things by easing back on the tempo at first, fusing robust hip hop drum breaks with fat warm analogue bass pads and airy synth atmospheres, in what’s easily the moment most akin here to Vibert’s parallel downbeat explorations under his given and as Wagon Christ. It isn’t too long before the dancefloor BPMs begin to shift into gear though. ‘It’s The Disco’ merges galloping disco snares with a bouncing analogue bassline while jazz-soul synth pads melt over sampled latin-disco vocal exhortations, before ‘Brush The Bush’ takes things off into Chicago-tinged piano-house, as melodic keyboard runs merge with showery hi-hats and steel-edged snare programming. Elsewhere, ‘Discuntek’ sees live slap bass adding satisfying elasticity to what’s easily one of the most fluid disco-funk workouts here. Longtime Kerrier District fans will already have a good idea of what to expect here, and they won’t be disappointed.